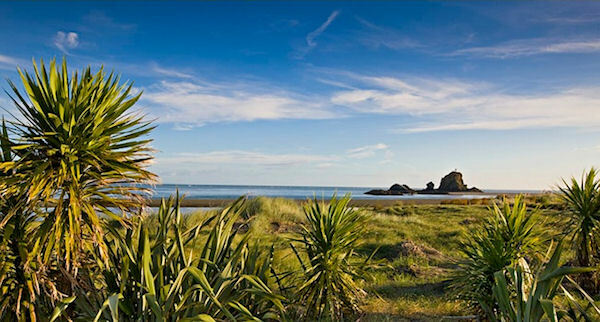 Auckland Guided Tours of West Auckland and the famous Waitakere Ranges on Auckland’s West Coast on a very personal tour. Be amazed by Auckland's famous West Coast with its subtropical rainforest, soaring cliffs, roaring surf and stunning black sand beaches. Walk along the deserted shore, with the sound of the sea in your ears, the wind in your hair and the salt spray on your face. Keep away from the masses and try our multi award-winning tours in very small groups. After pickup we drive to the West, leaving behind our beautiful city surprisingly quickly as we pass through Titirangi, which translates to "Fringe of Heaven" in the local Maori language. Titirangi has several nice cafes and bakeries, which the locals love to spend time in especially at weekends. We then enter the beautiful native rainforest that is the Waitakere Ranges, made famous by many movies that have been filmed here. As we drive through lush rainforest, many of our guests comment on how dense, varied and unlike anything they have ever seen before this forest is! We reach the Arataki Visitor Centre, which helps us explain more about this very special place. There are several very interesting exhibits on display here and let's not forget to mention the breath-taking view across part of the Waitakere Ranges and the huge expanses of the Manukau Harbour from here! We continue on towards the West Coast and reach it in form of what we consider the most beautiful black sand beach of them all, where we guide you personally to the glorious, roaring surf that constantly pounds this breath-taking place. We give you enough time to experience this beautiful place and ensure you have a good understanding of its significance. Of course we always keep a watchful eye out for the Flora and Fauna that live here and will point these out to you. Many native plants were used extensively by Maori and we explain which ones were the most useful; in fact Maori still use these plants for medicinal purposes today. Pick-up from Auckland central, all transport, a full, personal, half day Auckland Guided Tour of West Auckland and the Waitakere Ranges, snacks and hot/cold drinks. Appropriate clothing for weather conditions on the day, walking shoes, sunscreen and definitely your camera!